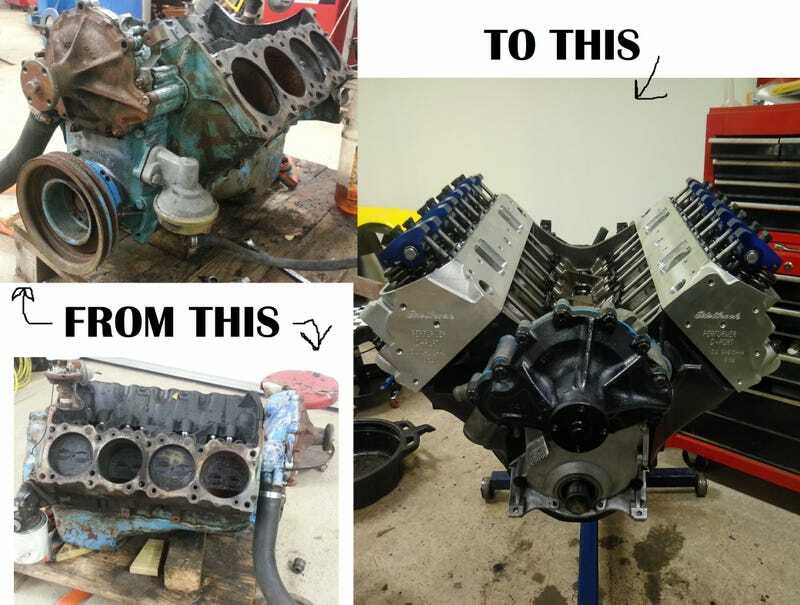 That engine then sat for a very long time before being finally sent off to a machine shop where the block was bored .06" over and the crank and rods was balanced among some other things. After that I installed some new pistons, put the main caps on and then wraped the whole thing in plastic film and then left it as is for some 3 years due to not having the economy of doing what I wanted to do with it. Now however! After a couple of trips back and forth to the States packing as many engine parts as possible in my luggage (yes, an aluminum head will clear the TSA) on the way home I have finally accumulated enough parts to start building the engine again, which BTW is a Pontiac 389, or should I say 400 now that it’s .06" over. Heads are going on. I ended up choosing a set of Edelbrock Performers, should be sufficient for my needs. High pressure oil pump, hydraulic roller cam and chain drive all lined up and in place. Lifters, pushrods and rockers in place. Hopefully this valvetrain will be much quieter than in my old motor. And that’s where I am right now. I am currently waiting on my valley pan to clean up a bit while it’s soaked in a bath of diesel. Hopefully that and the intake will go on next weekend and then I’ll only need a couple of more things and I’ll be good to start her up.